This week we have drawn the Clear Blue Sky card. I LOVE this card! 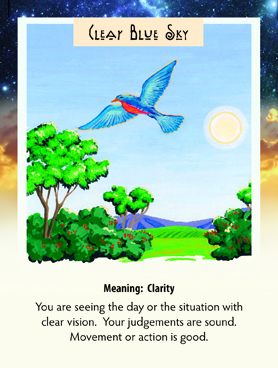 It indicates that your vision of the world is pretty clear right now and that it is a good time to decide about things because your judgement is especially sound. If you have been looking at a situation in one way, but now you see it with a new, higher perspective, allow yourself to accept the new vision. It may feel like you just put on glasses for the first time that you didn’t realize you needed and you can see details you had not been able to previously.